Thanks for that Alan. Only 681 to collect so get going everyone. It does sound daunting Ian. However, the simplest and most cost effective way I've found of completing the set is to purchase a box of 100 packs (500 stickers) and buy what's outstanding from one of the multitude of eBay dealers. I have made some excellent contacts over the years and can always recommend a very good dealer if anyone decides to collect them. 80p a packet for just FIVE stickers? Panini really starting to milk the cash cow now. I might not even bother. That's always a good strategy although in this case it means you'll still be at least 181 stickers short. Article in the Mirror online about Panini's insane pricing for this series and how it will cost a minimum of ?109.60 to complete the album. Precisely why I will not be bothering this time around. At the moment you can buy a complete set for 140.00. The price will drop over the next few months. Dont forget all the update stickers. could be another 50-100 to collect. ... and then there's the gold version stickers from Switzerland (https://cartophilic-info-exch.blogspot.co.uk/2018/03/panini-fifa-world-cup-russia-2018_53.html) where the album has a gold coloured cover too. There are extra stickers in Mexico, Portugal, Germany, Austria and Switzerland that I know of so far. 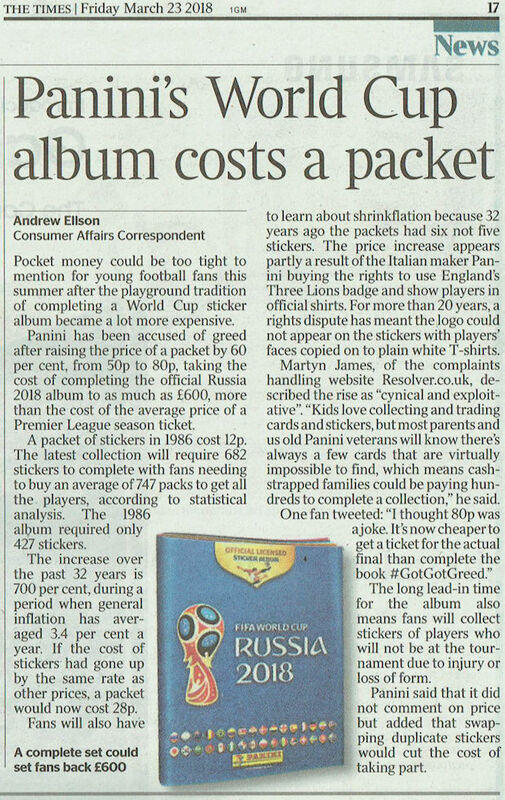 There was a good discussion on the radio yesterday about the price of the stickers, it seems that 70% of those that buy the stickers are over the age of 35, seems Panini think we are all made of money i will not be buying them. Did spot one in the road yesterday perhaps i should have picked it up as it may well be one that someone requires to complete the set. I was having a conversation today with an ebay dealer who only ordered a modest amount of boxes due to the price thinking they may be slow sellers. They have now ordered many 1000's of stickers due to the high demand! The BBC is all over this today. A friend of mine opened a box of the Gold Swiss stickers - 500 stickers and only 4 duplicates. At that ratio 2 boxes would complete your album and if you sell on eBay you'd have 320 stickers available to help claw back some cash. Down to 50.00 Will buy the set in a few weeks. Any one no when the update stickers are due out. likely in germany.